RingCentral offers two competitively priced virtual phone system solutions for business owners. RingCentral Professional is focused on inbound call solutions for the mobile professional, while RingCentral Office provides a more comprehensive business communications solution. Each offer high functionality and flexibility – something a business values. RingCentral’s focus since their inception has been to make office communications easier and less complicated. With the modern office in mind, RingCentral offers a wide range of business cloud-based phone solutions to accommodate professionals and their expanding needs. For the price, RingCentral by far offers the most comprehensive list of included features – including call recording, video conferencing, faxing, etc. Therefore, users may find that they get more for their money with RingCentral. Most importantly, RingCentral can be completely customized to the needs of your business and scale alongside your business's growth for maximum usability. Excellent Phone Service for Small, Mid and Large Offices as well as the Mobile Professional. 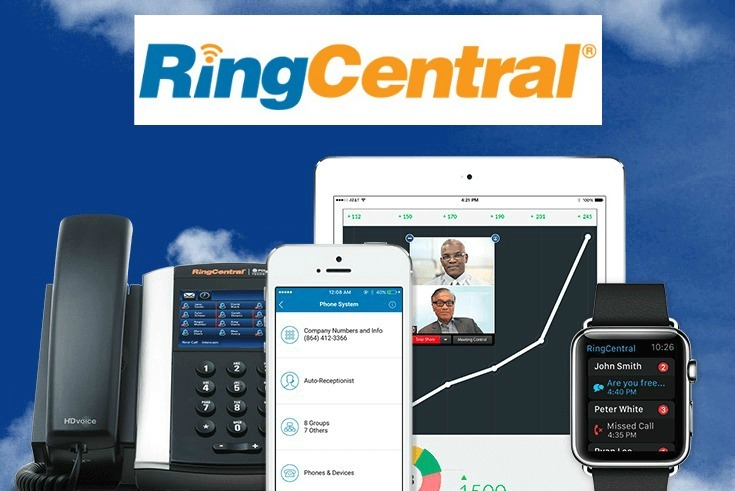 Who is RingCentral Best Suited For? RingCentral Office offers three pricing plans in addition to their call center plans. Each monthly price is charged per user. There is no contract for their plans, and depending on the plan anywhere from 1,000-10,000 toll free minutes are included. RingCentral Professional is priced the cheapest, but local and long distance calls are categorized separately in the top-level package. The basic package includes 300 local, long distance, and toll free minutes, while the premium package offers 2000 local and long distance minutes, as well as 1000 toll free minutes. RingCentral is also one of the few to offer call center plans – and we're talking true call center plans. Most virtual phone systems disallow call centers entirely. Known as their Contact Center plans, these call center-centric cloud-based phone systems range from $99.99 per month to $179.99 per month and come with advanced features. While initial prices may seem high, once you consider the features that are included for free as well as the company's reliability (99.9%), you will find that RingCentral is one of the better priced virtual phone systems out there. Also, with RingCentral, the more users you add, the cheaper your monthly per user price will be – with discounts going as high as $20 off per user per month. One thing to note about RingCentral (and something to consider when researching other virtual phone systems out there), is the fair use limit for unlimited calling plans. While you are offered unlimited minutes, you are still technically restricted by fair use – but at a 98 percent excessive use limit. That means if you use more than 98 percent of the unlimited minutes that other RingCentral users consume, you will then be charged a per minute rate for calls above that limit. But, 98 percent is a very high threshold and most companies will never find themselves going over it – other companies have much lower fair use percentages. RingCentral Office provides a wide range of call management features, such as auto-receptionists, answering rules, call forwarding and screening, extensions, call recording, call logs, softphone options, caller ID control, missed call and message alerts, and dial by name directory. While RingCentral does support 911 calling, there may be times it does not work properly. Also, users will encounter a 911 fee for using 911 on their virtual phone system account, but it is important to note that this is something that is very common with all cloud-based phone services and RingCentral is by far not the only one to charge for 911. Users have access to call analytic reports too.They can create reports focusing on historical call data, including inbound/outbound call volume, total number of calls per month or week, and information regarding each call. These analytics can be pulled online as well as through their app. The goal of these analytics is to let business owners see where their minutes are going – and track employee phone usage – to better understand their phone needs. This can also provide businesses with insight so that they can adjust their plans as needed based on phone trends and needs. Each plan for Office includes one main company line (local or toll free), one fax number (local or toll free), and one local number dedicated to each user. Professional plans include only one line. International numbers are also available for companies that wish to establish a local presence in another country. Additional numbers can be added to each at an additional cost, which is something most providers charge for as well. With larger plans from RingCentral, you get unlimited extensions for multiple office locations. RingCentral Office has a multitude of advanced features, but only those that are phone specific are included in RingCentral Pro. RingCentral does support inbound and outbound faxing through the Internet dashboard – something other virtual phone system providers cannot match. RingCentral is also all about collaboration. They offer video conferencing, audio conferencing, online meeting capabilities via your account, and team collaboration via Glip. They are also one of the few to offer SMS text messaging – which means companies can send text messages via their business virtual phone system. This is an extremely unique feature and users can enjoy unlimited messages as well as specialized business texts, email notifications and push notifications. One thing that truly sets RingCentral apart from other cloud based phone systems is their integration capabilities. They allow you to integrate with third party apps such as ZenDesk, Desk, Office 365, Dropbox and more. By integrating, you have more access to features, but also you can better manage your calls and your company. Both RingCentral Office and RingCentral Pro are easy to use. RingCentral works with existing equipment so there is no requirement to buy new phones. Those familiar with their old phones do not have to worry about learning how to operate the new hardware or incur the costs of purchasing new Internet phones. This makes RingCentral very easy to install and operate. RingCentral offers 24/7 customer support for both their RingCentral Pro and RingCentral Office products. However, it’s worth noting that only plans with two users qualify for this type of support under RingCentral Office. Also, while they do have 24/7 capabilities, RingCentral outsources their customer support overseas. They have been criticized in the past for offering poor quality customer support and because of language barriers, their customer support staff are not always able to accurately fix the problem. Over the past few years, however, RingCentral has made great strides in improving their support, which is why they offer U.S. support for office plans with over 20 users. RingCentral also offers a 99.99 percent service level agreement and always features reliable, fully redundant networks – so you never have to worry about your service being “out of service” when it matters most. In all honesty, RingCentral is one of the very few (if not the only virtual phone system) to meet the needs of all businesses. If you are a startup or even have a home office, RingCentral has plans to accommodate you (see their Professional Plans). If you are a small business that wants to escape high prices of local phone services and keep it professional, you will find plenty of options and fair prices at RingCentral (see Office Plans). If you are a large business or even a local retailer offering call center services, RingCentral can also accommodate your needs. RingCentral is by far one of the most versatile cloud-based phone services out there. They are fully-featured, reliable (99.99 percent), and have so many unique features from SMS texts messages to third-party application integration that it is hard to find a business that couldn't use and be satisfied with RingCentral. Full Features for Free: RingCentral Office and Professional both include features like inbound call management, voicemail with email transcripts, internet fax options, call forwarding options, auto receptionists, flexible answering rules, and calling queues. These features allow users to customize the user experience according to business needs. Even better, most of these unique features are included as part of the monthly price – while other virtual phone system services usually charge an extra monthly fee per service. SMS Texting: Want to send your clients text updates about their upcoming appointment? Meetings? Remind them of customer appreciation specials? RingCentral is one of the only virtual phone systems to allow SMS texting straight from your business number. You can still maintain a professional identity while contacting customers in one of the more convenient ways. They offer unlimited SMS texts, push notifications and even email notifications all from the same dashboard. Number Transfer: The ability to transfer your current number makes integrating any existing services with RingCentral that much easier. This is especially important for older, established businesses with an established number and customer base – so companies do not have to worry about changing their number with clients or potentially losing out on new clients during the transfer. SalesForce, Outlook, and Box Integration: RingCentral’s ability to integrate with SalesForce, Outlook, and Box further enhance the user experience and allow for little to no transition time after implementation. Businesses can keep using these programs without relying on or learning new, RingCentral proprietary based programs. Other programs you can integrate with include Desk.com, Google, Microsoft Office 365, Oracle Sales Cloud, and Zendesk. Softphone Options & Apps: Part of RingCentral’s brand is their focus on the modern workforce and office environment. Its mobile app and softphone options are in line with that brand image, easily allowing the use of mobile phones in or out of the office as opposed to traditional landlines. This allows for increased flexibility and lowered overhead for those businesses that do not otherwise need bulky landlines and equipment. For those with both, it allows for easy call forwarding from a desk phone to a mobile device. Unlimited Conference Minutes (Office): RingCentral Office offers unlimited virtual conferencing minutes. Businesses with heavy travel demands or that includes workers in varying locations and/or telecommuters can enjoy the security of conferencing from the office despite their physical locations. Free 30-Day Trial: RingCentral Office and Professional offer 30-day trial offers for those that are unsure whether or not the product will fully fit their business needs. This is especially important, because most cloud-based phone system providers that do offer a free trial limit users to 15 days and there are an even larger majority of virtual phone system providers that offer no free trials – so business users must risk their first month's payment. 24/7 Support (Office): 24-hour customer support is available 7 days per week for those with 2 or more users. Implementation Advisor (Office): In addition to customer support services, RingCentral Office customers with more than 2 users also qualify for a free implementation advisor to help walk them through setup. While setup is relatively easy, novice cloud based phone system users may find this additional help useful—especially considering RingCentral’s lack of physical presence. Call Center Support: RingCentral is one of the few companies to offer call center plans. Most virtual phone systems specifically exclude call centers from their service plans. You can choose from three plans with the RingCentral Contact Center that range from basic voice to inbound calls as well and inbound/outbound call centers. Prices will range from $99.99 per month to as much as $179.99 per month per user. These call center plans also feature chat, SMS, email, advanced IVR (on some plans), standard IVR, and multiple agent ports. Vanity Number Charge: RingCentral charges a one time $30 fee for vanity numbers. However some type of one time fee for Vanity numbers is pretty customary, and some companies charge monthly rates for their vanity numbers while RingCentral only charges a one-time fee. Limited Extensions (Professional): The number of extensions allowed is limited per plan. Although users can opt to add more virtual extensions, each additional extension costs $2.99 per month. Limited Support for Low Level Plans: RingCentral Office and Professional offer web and phone support, but access is restricted to web-based support only for low-level plans. Specifically, RingCentral Office users only qualify for 24/7 phone support if the plan includes 2 users. Similarly, RingCentral Professional restricts its phone support access to ProPlus and ProPower users. Also, RingCentral has been criticized in the past for offer poor customer support. Most of their support is outsourced to other countries; therefore support teams may not be able to accurately solve a users problem. While they have made great strides to improve support, they only offer U.S.-based support to office plans with more than 20 users. Ideal phone system with plans for any business. RingCentral offers a wide variety of options for businesses in need of virtual phone system services. From their extreme flexibility to unique integration capabilities, RingCentral is ideal for businesses and professionals that want to take their communications to the next level.